pond) off the Eastern Metropolitan Bypass. 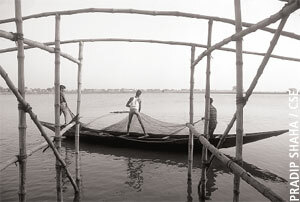 The move is in complete violation of the West Bengal Inland Fisheries Act, 1984. Environmentalists argue that the multiple functions of these wetlands have not been understood and adequate measures are not being undertaken to protect them. The survival of the wetlands is closely linked to the bheris. The latter are part of the wetlands spread across a huge area of 12,500 hectares. The wetlands have multiple functions, and are the largest domestic waste recycling area in the world created by local people to recycle wastewater of Calcutta. The use of these wetlands lies in treating wastewater in successive resource-recovery systems of pisciculture and vegetable farming. A baseline document on the management action plan for East Calcutta Wetlands and Waste Recycling Region, commissioned by the Calcutta Metropolitan Water and Sanitation Authority (CMWSA) and prepared by the city-based Creative Research Group says Calcutta saves Rs 400 crore as one time cost for installation. How can this cost be saved? The sewage generated daily reaches around 284 bheris. Sunlight acts on the shallow ponds to enhance algae growth, which in turn, supports bacterial population for degrading the organic materials. The ponds’ effluent is rich in phosphate. After being used in the pond, the water is further used for irrigation purposes in vegetable farming and paddy cultivation. The baseline document puts fish production at about 10,900 tonnes per day in 1995-96, vegetable production at 150 tonnes per day and paddy production at 15,000 tonnes per year. According to experts, the waste water level needs to be maintained at eight feet six inches. But the Premtosh Ghosh, general secretary of the Calcutta Fish Producers Association alleges that seven feet six inches, causing problems in sewage availability. Calcutta Municipal Corporation’s deputy chief engineer (drainage), Dilip Sanyal said the ecosystem is a unique one in the world, but consistently refused to admit any problem exists with the water level. “It is of no consequence consequence to say what the actual water level is. Eight and a half feet or 10 feet is unimportant,” he said.